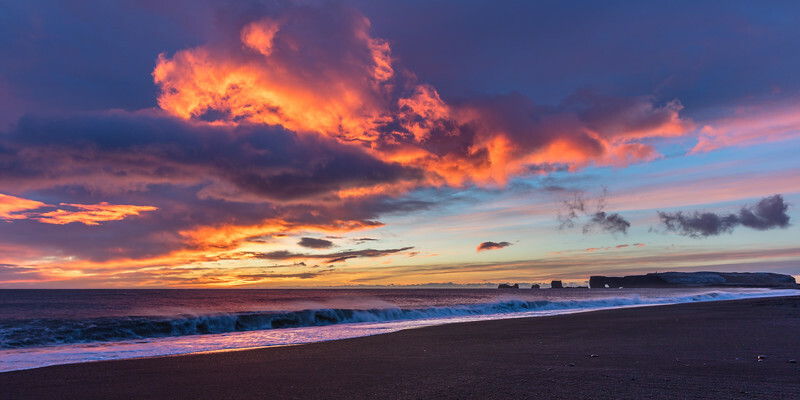 An intensely beautiful sunset at an extremely windy and expansive volcanic beach at Reynisfjara in Iceland, with one of a succession of powerful 10-12 foot high waves approaching the shore. Was nearly blown off my feet a few times on this beach and had to be very careful of the odd wave crashing much further up the beach than the others, always keeping a close eye on the sea and having no gear on the sand and a clear escape route. Iceland's beaches have claimed lives so you have to treat their truly awesome power with the utmost respect.